0. 2- 0                20 May 06   Burning Umagon. Freezing Karudio. Run to Victory!! 53. 2- 1        201     27 May 06   So Giaku! The Water Dragon of Rage! 54. 2- 2        202      3 Jun 06   Battle in the Park: Zatch vs. Kiyo?! 55. 2- 3        203     10 Jun 06   Penny's Revenge! Assasins on the Loose! 58. 2- 6        206      8 Jul 06   Defeat Milordo-Z! Each Person's Resolve! 59. 2- 7        207     22 Jul 06   Charge Into The Ruins! Kanchome's Strategy! 62. 2-10        210     12 Aug 06   Impact of the V! Very Melon!! 63. 2-11        211     19 Aug 06   Burrah! Victoream's Anger! 64. 2-12        212     26 Aug 06   The Fierce Attack of Dalmos! The Battle on Top of the Sand! 65. 2-13        213      2 Sep 06   Ponygon's Lightning Speed! 66. 2-14        214      9 Sep 06   The Red Spell Book of Promise! 68. 2-16        216     30 Sep 06   Tia's Plan to Confess! 71. 2-19        219     25 Nov 06   The Roar of Rao Diboren! 72. 2-20        220      9 Dec 06   Sing for Your Lives! The Terrible Belgim E.O. 73. 2-21        221      9 Dec 06   Dr. Riddles, You'll Always Be My King! 75. 2-23        223     16 Dec 06   Free Yourself from a Thousand Years of Pain! 76. 2-24        224     23 Dec 06   No Escape! The Wicked Zofis Returns! 77. 2-25        225     20 Jan 07   The Return of Sherry and Brago! 80. 2-28        228     21 Sep 07   The Crazed Warrior: Berzerker! 81. 2-29        229     28 Sep 07   Victory At Any Cost! 83. 2-31        231     30 May 08   Zagurzem, the 7th Spell! 84. 2-32        232      6 Jun 08   The Final Battle with Demolt! 85. 2-33        233     13 Jun 08   Sherry & Koko: The Bond That Can't Be Broken! 86. 2-34                27 Jun 08   Zofis Strikes Back: The Final Showdown of Friendship! 86. 2-34        234     27 Jun 08   Zofisu's counterattack Friendship's last battle! 0. 2-35                13 Jun 08   Sherry and Koko: The Bond that Can't Be Broken! 87. 2-35        235      4 Jul 08    Save Koko! Sherry's Dioga Gravidon! 88. 2-36        236     19 Jul 08    A New Departure! 89. 2-37        237     26 Jul 08    A New Year's Special: The Magnificent Victoream Returns! 90. 2-38        238      2 Aug 08   The Hurricane Test Battle! 119. 3- 0                 8 Sep 08   Tia's Courage. Only One Partner. Time To Heal Wounds. 122. 3- 0                 8 Sep 08   Legendary Kaguya. Gash's Summer Festival. The Girl That Returned to the Moon. 121. 3- 0                 8 Sep 08   Awakening Jealousy. Furious Goddess Chajiru Saifodon. 120. 3- 0                 8 Sep 08   We've Been Seen, Oyoyoyo! Shaky Momon. Tia's Great Explosion! 116. 3- 0                 8 Sep 08   Ultimate Spell Explosion! Garubadosu Aborodio. Rein's Dream. 115. 3- 0                 8 Sep 08   Rodeux's Fierce Attack. Dying Rein. Awaken, Kyle. 124. 3- 0                 8 Sep 08   Premonition of Separation. Suzume's Confession. Hiking Trip of Love and Youth. 117. 3- 0                 8 Sep 08   Kung Fu of Passion. Wonrei's Tragedy. Last Chapter of a Love Song. 118. 3- 0                 8 Sep 08   Gash is Kidnapped! Trap on the High Seas. Dartagnan Submerges. 126. 3- 0                 8 Sep 08   Journey Without Return. Wavering Determination. Faudo's True Form. 129. 3- 0                 8 Sep 08   The Miraculous New Spell Dima Buruk, I Am Not a Coward! 126. 3- 0                 8 Sep 08   Journey without return. Wavering determination. Faudo's true form! 125. 3- 0                 8 Sep 08   Heartless Riou. The Cursed Demons. Now, to Faudo. 136. 3- 0                 8 Sep 08   Faudo's Revial Draws Near. Return Device Activated. Rivals Stand in the Way. 120. 3- 0                 8 Sep 08   We've Been Seen, oyoyoyo! Shaky Momon. Tio's Great Explosion! 138. 3- 0                 8 Sep 08   Demonic Giant Soldier: Faudo. Light in the Middle of Despair. Kiyomaro's Secret Plan. 112. 3- 0                 8 Sep 08   Spin! Spin! Fall! Fall! Explosive Ice Skating!! 109. 3- 0                 8 Sep 08   Duel in the Northern Country. Fated Rival. Umagon Frozen!! 113. 3- 0                 8 Sep 08   A Letter from a Friend. Burn the Book!! Rein's True idenity. 139. 3- 0                 8 Sep 08   Aim for the Brain! Roaring Faudo. Desperate Reentry. 142. 3- 0                 8 Sep 08   Sealed Room. Alishie's Fight. Destiny Once More! 95. 3- 2                20 Sep 08   Attack of the Iron Army! 96. 3- 3                27 Sep 08   The Battle With Brago - Without Sherry! 97. 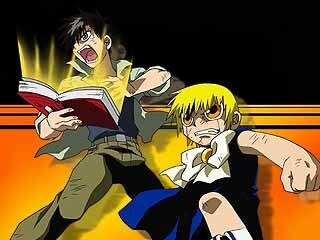 3- 4                11 Oct 08   Maestro's Revenge on the Mamodo World! 98. 3- 5                18 Oct 08   The Decisive Battle in the In-Between World! 99. 3- 6                25 Oct 08   Miss Wriggle's Class Is Now in Session! 101. 3- 8                15 Nov 08    A New Menace: The Boy That Speaks To The Wind! 102. 3- 9                22 Nov 08   The Beginning of A Friendship and the End of a Spell? 105. 3-12                 6 Dec 08   Q Attack! Q Ulitmate Transformation? My Name Is Coral Q. 106. 3-13                 6 Dec 08   Put Into a Pinch, Q's Counterattack! The Suppression of Every Spell!? 107. 3-14                 6 Dec 08   Electric Chain:  Ultimate Revolution, Renewed Baou! 109. 3-16                 6 Dec 08   Duel in the North Country. Fated Rival! Umagon Frozen! 110. 3-17                 6 Dec 08   Karudio's Fierce Attack! Fighters Who Burn up the Snow Field! Ponygon's New Flame. 111. 3-18                 6 Dec 08   Dance! Burst Open! Swing! Huge Airport! 123. 3-123                 6 Dec 08   Roar of Time! Bari vs. Ted. Which will disappear? 127. 3-127                 6 Dec 08   Arrival at Faudo! Life-or-Death Assault, Awaiting Assassins. 128. 3-128                 6 Dec 08   Kiees and Buzarai's Symphony of Seath; Farewell, Kanchome! 114. 3-314                 6 Dec 08   Weakling Kyle. Papipurio's Mustache. Rodeux's Trap.